Happy Friday! I’m hoping today isn’t as wet and rainy in my neck of the woods as it was yesterday. The rain was a bit insane yesterday, and I stayed in where it was dry and warm. I really should’ve gone to Red Box and gotten a few movies for yesterday but you live and learn. For today’s Friday’s Fabulousness I have 2 things I want to share. The first came from a reader, CSH, and I LOOOOVE IT! I love the Keep Calm and Carry On posters (I have a skin on Pierre that says it) and apparently there are lots of new versions! 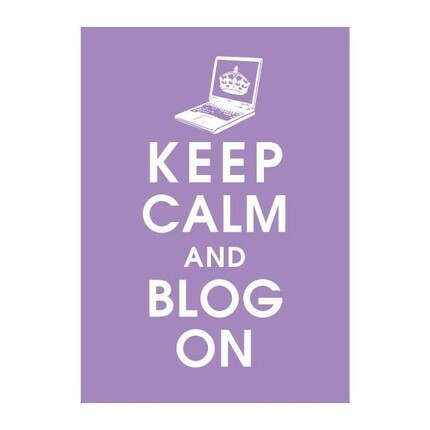 My personal favorite that CSH brought to my attention, Keep Calm and Blog On. I really think my little home office space needs this since that’s where I do the majority of my blogging. How adorable? They also have tons of other sayings. For my sister ABW I’d get, Keep Calm and Bake On, for my sister HAW I’d get, Keep Calm and Eat Cake and for Jess I’d get, Keep Calm and Drink Tea (cause that’s what we do). At some point I’m going to have to purchase 1 or 2 of these. The second fabulousness I wanted to share was of my blogging buddy, Sydne Summer of Think Thru Fashion. If you’ve been reading the blog long enough you may remember when I profiled Sydne on my The Art of series. Well, Sydne is now doing webisodes on Mystyle.com and when I saw one of the shorter segments run on the Style Channel I screamed, “I know her!” to my TV. I was so excited and happy for her since she had been hinting at her new project on Twitter (you can also follow me too on Twitter). I immediately logged on and tweeted her that I saw it and screamed (and her hair looks pretty fab in these videos too). So check out her first webisode below and if you can’t see it you can click on the Mystyle link above (and get some great tips) and show Sydne some love! I hope to see more in the future! Have a great weekend everyone. I think I may run off to see an early morning showing of The Social Network, I’m so intrigued! And if you want to laugh, go see Easy A this weekend. I loved it. Have a fabulousness filled weekend! .-= Fasshonaburu´s last blog ..Duct Tape Leggings =-.